I loved Unreal but playing Tribes online blew me away – albeit very slowly at pings of about 450. That was when my first online gaming persona of Greggar was born. I was a very average player and was not particularly social. I guess some of that came down to frustration. My Keratoconus would always hamper the clarity of my vision when playing. I was late coming into Halflife and Team Fortress Classic. It was only because the employees of a workplace of mine played these that I got into them. Online I met a player named Horendus. He played for a local Aussie clan called uY (Up Yours). After using my graphics skills to make him a tag, he inducted me into uY as [uY]ThinkICare!!! Immediately below is a screenshot of myself using that alias with two of my buddies: notTricky and One-Eyed-Willy. My gamer tag. 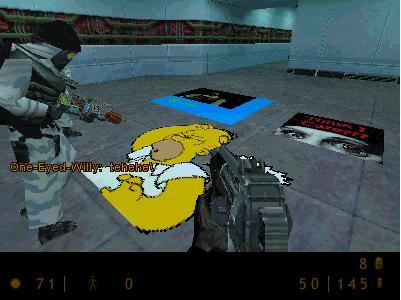 Halflife Deathmatch let us “spray” these decals onto architectural features (floors and walls) in the game. [uY] was my first experience of a clan. For those of you unfamiliar with the entire clan concept, it’s basically a club. The club was run by a DJ whose name was Tweeker (Tweek for short). All I can recall of him is that (according to rumour) his marriage broke up due to his addiction to games. This was ominous and I determined not to go the same way. [uY] had two branches: one played HalfLife Deathmatch and the other played CounterStrike. Personally CounterStrike was way too slow moving and repetitive for me. In 2000 clans tended to interact either in-game or via forums (notice-boards). Below is a screenshot of [uY]’s in 2001. Note that it was hosted by QGL – the Queensland Gamers League. QGL hosted a huge number of clans in the early days of Australian online gaming. So why did I play these games? What was the attraction? I guess it was like being a kid again. In a game communication is somewhat pure. By that I mean that you have an avatar representing your appearance, so instantly you are not judged by how you look. Be you fat, skinny, too tall, too short – none of that matters. What matters is how your avatar acts and how you chat. Several times in HLDM I just sat in a game level, not really playing, just exchanging words with the likes of Casual or hcap or One-Eyed-Willy. One time some of us used trip-mines in a game to see who could build the tallest trip-mine-ladder. Some years later while playing Urban Terror some other friends and I would actually sing over microphones! It was all fun craziness. But all was not just fun and fragging. 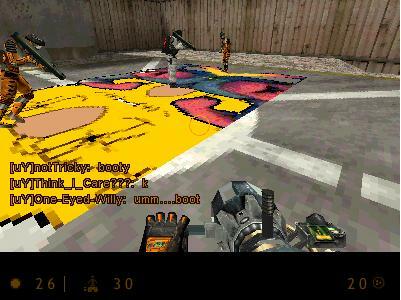 In 2000, the Halflife Deathmatch scene in Australia was turning nasty. The top clans was Gods of Gore (GoG), Merciless Klan Killers (MKK) and Dark Side (DS) and they were so insanely better than other players that accusations of hacking abounded. This just fuelled bitter flame wars on public servers. For fairly average players like me, being caught between superb fraggers constantly shooting me down and bitter, swearing gamers just ruined the entire experience. Being married and wanting to stay married, I adapted to a habit of playing late at night. I made other friends, many of whom turned out to be older players like myself (or at least not children). Among these were members of a clan called Prodigy of the Damned (POD), led by a bloke called AntiSocial. He was a very down-to-earth type guy and we had several great chats. Like me he wasn’t particular the top tier of gamer, but he was easily second tier and I learnt a lot from him.